The official Venom poster is here. Sony is currently working on several Spider-Man spin-off movies that won't actually include the famed webslinger in them. Instead, these movies will center on other characters from Spidey's world, starting with the historically villainous Venom, as portrayed by Tom Hardy. Now, to go along with the reveal of the full-length Venom trailer, a new poster for the movie has arrived, featuring Tom Hardy working with the symbiote in harmony. This poster is in many ways exactly what you might think it would be when you hear Tom Hardy is going to be playing Venom. 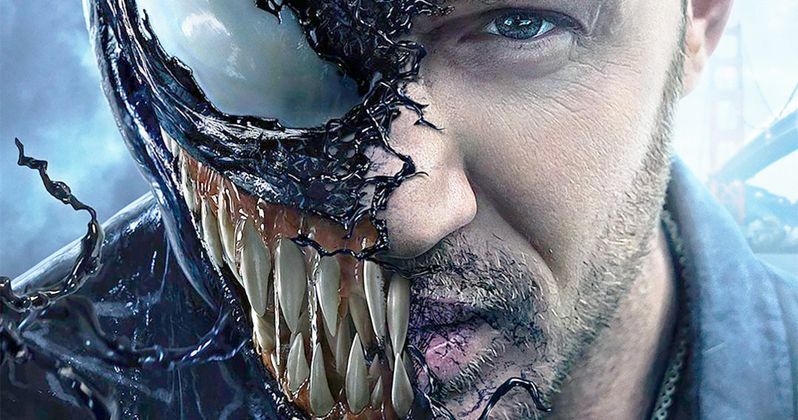 The left half of the poster is his face as the character from the world of Marvel Comics and the other half is just Tom Hardy's as Eddie Brock. We can see a little bit of San Francisco in the background, since that's where at least part of the movie takes place and there's a bit logo for the movie at the bottom. That's about it. It appears as though Sony is really selling this movie on star power and the popularity of the character. In addition to Tom Hardy, the movie stars Michelle Williams, Riz Ahmed, Jenny Slate and Woody Harrelson. Venom is a character that many have wanted to see done properly on the big screen for a very long time now. A version of the character did appear in Sam Raimi's Spider-Man 3, as portrayed by Topher Grace, but in the minds of many, the less said about that movie the better. While many hoped we would be seeing the monstrous and powerful character getting a chance to duke it out with Spidey, as is usually the case in the comics, this movie is taking inspiration from storylines where Venom is more of an anti-hero, which comes after years of being a straight-up villain. Sony is leaning hard on the anti-hero angle, as both the new trailer and the caption for this new poster use the line, "embrace your inner anti-hero." They want to make it clear that Tom Hardy isn't playing a bad guy here. The previous teaser trailer that was released didn't actually feature any Venom in it, which puzzled fans. Now though, both the trailer and the poster show off the look of Venom, which appears to be pretty faithful. There are lots of teeth, he's big and he even has the long, kind of ridiculous tongue that seems to work much better in the pages of a comic book. At least for now. Venom is directed by Ruben Fleischer (Zombieland) and is set for release on October 5. If this goes over well, expect to see other Spidey spin-offs such as Silver and Black, Nightwatch and possibly Morbius the Living Vampire. Sony isn't going to let their library of characters go to waste, but can these characters really work on their own without Spider-Man? We'll have to wait and see. Be sure to check out the brand new poster, courtesy of the Venom Movie Twitter account, for yourself below.